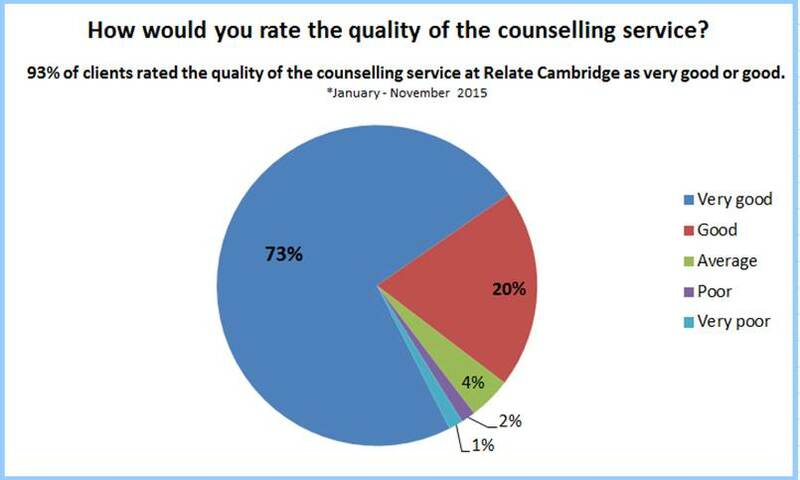 Relate Cambridge asks its clients to feedback on the service that they receive from booking an appointment to the end of counselling. "I found my relate counsellor to be very approachable and easy to talk to about things that I have never spoken to anyone about, as well as being really clued up on why I may be having the issues I am having. She helped me to understand myself a lot better, feel less isolated with my problems and feel like there is a solution and although it will be difficult it can be done and I can do it." "I would recommend Relate to anyone." "Relate is an excellent service and probably saved my marriage and my sanity." "My marriage was on rocky ground and I was struggling with how to get us back on good ground. Relate helped my husband and I to get 'stuff' out of the way and reconnect at a level we hadn't done for years. We are now enjoying each other again." "Relate was very helpful in allowing my partner and I to talk calmly and openly about the issues in our relationship, without fear of resentment and judgement." "Relate helped me to explore complex relationship problems in a safe, anonymous, helpful environment. For me it has been a very useful learning exercise which I am using to improve those relationships. Thanks to all involved." "I have learned much about myself during the course of our counselling and the recognition of this has resulted in a great feeling of power and control over my own happiness. We both have a much better insight into our own characters through your counselling and have learned much about one another. I am sure that we will continue to learn now that communication is so well established." "I was very nervous but was instantly made to feel comfortable and at ease." "Very reassuring - I can now see the light at the end of the tunnel!" "Relate turned out to be a life line for me. I didn't really realise how bad things were or how much better they could be. The opportunity provided by relate, the ease with which I could embark on therapy with them made all the difference. We achieved such a lot together with our counsellor, who was brilliant for us and dealt with our problems with wisdom, care & humour." The aim of Relate is to 'build better relationships'. 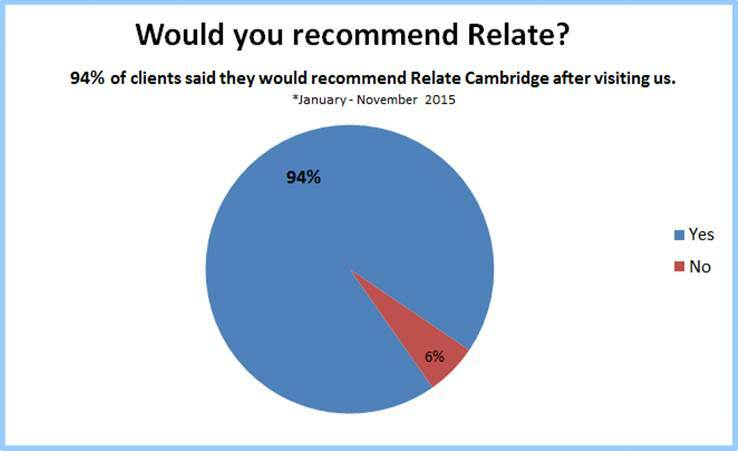 To monitor our efforts, we ask clients who have attended Relate Cambridge for counselling to take a few minutes to fill in an evaluation form. We are grateful for your assistance in providing the information asked for, as we feel it will be invaluable in enabling us to monitor and improve our services. Click here to fill in our Evaluation form for Couple Counselling. Click here to fill in our Evaluation form for Family Counselling. Click here to fill in our Evaluation form for Psychosexual Therapy.